Hiked up to the summit of Mt. Diablo State Park today. At over 3800 ft. elevation it is said that on a clear day one can see past the Golden Gate bridge on one side and all the way to the Sierra Nevadas on the other. Sadly, today was a little hazy so the Sierra Nevadas weren't very visible. 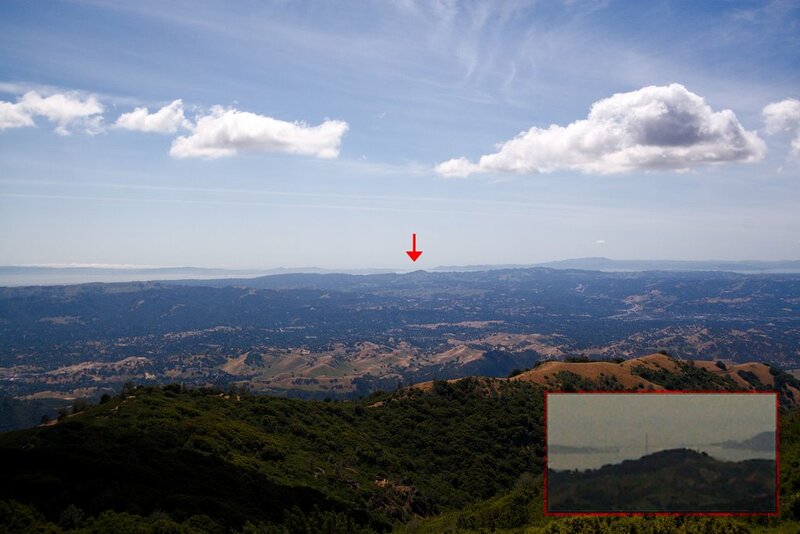 However if you looked carefully in the direction of San Francisco, you could make out the Golden Gate bridge. I have a blown up the center where you can barely make out the bridge. Technical specs: Canon 30D, 10-22@22mm, f/8, 1/640s, ISO 100, mild shadow/highlight and curves in PS. I can't wait to see the bridge. But now I have the image of Magneto moving it and it magically turning into night time from one shot to the next seared into my brain.